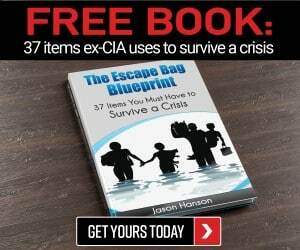 Any prepper will need multiple ways to protect themselves and their family when SHTF. A tactical pen is a great option for a back-up non-lethal weapon. A strong sturdy pen is likely part of your escape plan. You will need one to write directions, make lists, and label items/storage spaces. You might laugh at the idea of a pen being anything more than a weapon of utter desperation, but if you were on the receiving end of several inches of hardened metal being driven into your sternum you’d probably change your tune. Tactical pens have been popular self-defense products for years now, offering preppers, protectors and everyday people another defensive tool in the toolbox, and this one has some special advantages. A tactical pen is a pen like any other… if that pen had a monster truck and a T-Rex for parents! In seriousness, tactical pens are writing implements that usually have special features that make them suitable for use as striking and jabbing weapons. Common hallmarks of tactical pens are slightly oversized longer-than-normal bodies, heavy knurling, sculpting or texturing for grip and long, tapered points for maximum application of power. The bottom line benefit with tactical pens is that they are durable enough to withstand repeated blows to hard surfaces (like foreheads!) and ergonomically correct so they are easy for a defender to grip. Anything else is just a bonus in the right circumstances. There are plenty of manufacturers of tactical pens on the market, each with their own trademark style. Some are so aggressively styled they look like more like ninja weaponry than writing implements. Others are so conservative and subdued their heritage hardly betrays them from regular pens. There are even some sturdy and high quality normal pens that can, in a tight spot, be employed as you would a tactical pen. Consider the following features to be desirable for a tactical pen. There are mountains of these things out there and more made every year, so you need to learn to sort the wheat from the chaff to get a good one. Slightly Overlong Body: A good tactical pen will be a bit longer than your average pen so it can protrude from the top or bottom of your fist (or both) when gripped. This is critical for application of maximum force and precision when striking with it. Don’t get one that is too long; about an inch or inch and change on both ends of your fist is plenty. Texturing, Knurling or Sculpting: You will not be using this pen in extremis to sign the lease for a new car, or ink your John Hancock on a credit card receipt. You’ll be using it to skewer hands and crack skulls, so make sure your tool works with you to stay in your grasp. Knurling, stippling, grooves and lands or other techniques for improving grip are all okay, but test the pen if at all possible to make sure it is an anatomical match for you. Subdued color: Black, chrome, copper. You know, pen colors. Leave the high-vis anodizing, patterns, zombie green spattering and other outlandish and attention grabbing colorways behind. You want this pen to pass as what it is, not a special pen. Strong construction: a good maker will craft their pens from high quality steel or aluminum. Thick brass is also acceptable. Don’t settle for cheapo knockoff tactical pens made from metal of some type. You’d be surprised how easily some metal can bend or break under the shock load of a strike. Point Options: Different styles of point or impact surface work better for different styles and people. For instance, a blunt tip will reduce the amount of damage that you can inflict, but is less likely to leave lasting injuries and is better for pain compliance techniques than a sharply-pointed model. Other Features: A lot of tactical pens have special features that go above and beyond and give them more than two functions. Some come with a magnesium fire starter. 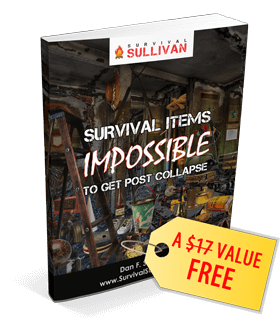 This will be great if your bug out location is in the wilderness. Any extra help getting a fire started will be welcome. There are even hidden handcuff keys on some models. Typically, these keys are contained in the breaker cap. Just remove it for access. A pretty common extra feature is a glass breaker, perfect for getting you out of a vehicle in a hurry. It’s not all good out there. There are definitely some features you don’t want on your tactical pen. Some of these will draw unwanted attention. Others will injure you. Caveat emptor! Spikes of Doom: Any pen that features a preponderance of spikes in its design is to be avoided. Properly called crenellations, these castletop-looking things are supposed to be good for scratching, twisting and digging on an attacker in order to gain compliance or an opening through infliction of pain. Okay… You know what really hurts? Getting jabbed with a pen held like an icepick at full throttle. Crenellations on the top of the pen also prevent you from safely utilizing the thumb-on-top grip (just like clicking it) to reinforce your grip and provide more power. The only thing this feature is good for is collecting DNA from your assailant. Super Tactified Appearance: Just because we want a tactical pen does not mean we want it to look like a tactical pen. A pen that is too big, far too aggressive looking and, well, weapon-like in nature will attract the wrong kind of attention. In the case of secured areas and other checkpoints it could see you get your pen taken from you or see you get in trouble. Don’t risk such a thing over aesthetics! You can show everyone how cool you are some other way. 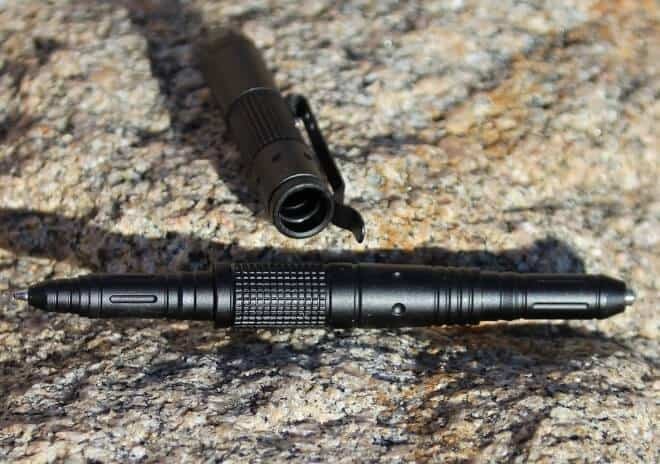 Lack of Clip: Trust me, you want a clip on your tactical pen. The ability to clip it to a pocket, belt, bag, or even inside the neck of a button-down shirt is priceless for setting up a quick, clean draw. Make sure any clip you do have on your prospective pen will not interfere with your grip. Aside from those features, you should have plenty to choose from in makes and models, each with their own style, heft and other essential differences. I know you’ll find one that is just right for you. Beware! These little gems are apparently status symbols to some and a few companies charge accordingly. You don’t need to spend hundreds of dollars on a pen you plan on jabbing some guy with unless you are an executive. Good pens can be had for modest prices from the makers in the next section. While not as cheap as a Zebra, Parker or Bic you are used to jotting notes with, these are precision machined from high grade steels and other metals and will last a lifetime. Not a bad investment for a discrete defensive option. Below is a list of quality tactical pens that are currently on the market. This pen is made of extremely durable aircraft aluminum. Plus, it has a more than functional glass breaker in case you’re trapped in a sinking car, for instance. Ink can be replaced with standard pen refills. There are a few downsides to this model. For one, the grip is not great except when holding it in the clenched fist position. Look for a different option if you prefer to hold hand weapons a different way. Also, the tip is the same model made by the Azan Company. They both come from the same manufacturing house in Asia. This model runs about $5-10 more expensive than the Azan model because it bares the UZI UZI name. This is the perfect size to fit into a shirt pocket. It is solidly constructed, well balanced, and easy to write with. Its tip is not overly powerful, which can actually be an asset. It will deliver a very painful blow without causing lethal harm. The black finish also makes this model easy to conceal. One thing that makes it difficult to conceal is the name “Smith and Wesson” is overly large. Obviously, this gives the model away that it is some sort of weapon. Before purchasing this item, make sure to decide if you can hide this label from site or scratch it off. In any case, never take it through a security checkpoint. The Aviation Aluminum is designed to easily hook onto backpacks, bags, and notebooks. Like the UZI model above, it can break glass, but this one comes at a fraction of the price. The only downside to this model is it is a bit larger than the average pen. It is a no thrills, pretty cheap option that will get the job done as both a writing tool and a weapon. As you can tell from the title, this pen can do a lot of different jobs. Plus, its rugged aluminum makes it durable and its size makes it easy to conceal. Under Control designed this pen to be everything its competitors lacked and their customer service is excellent. The only downside that can be found on this model is the writing utensil isn’t overly high quality, but it works well. That’s a bit of nit picking. This model has everything and is solidly put together. The Gerber Impromptu was designed with the help of law enforcement and has a lot of nice features. It comes with a “Rite in the Rain” ballpoint pen, meaning it can write when damp. Plus, it has a button mechanism to turn it into a ballpoint and a glass breaker. The only downside is that it is a bit hefty. However, this shouldn’t be much of a problem unless you are specifically looking for an extremely lightweight option. The weapon and pen are both above average and will undoubtedly get the job done. This model has been used with no issues by guards in maximum-security prisons. It’s a great choice. This model has a great grip. Its wavy design makes it work for both the pen and knife function. The pocket grip is also extremely strong and won’t break off. Plus, it’s waterproof. Overall this Smith and Wesson is a great purchase. The only downside is that it looks a bit strange. Often when going through a security check, it has raised a few questions. Don’t try the TSA with this item. Chances are you can get through with no problem, but don’t take the risk. Army Officer and martial arts instructor James Williams designed the Columbia River Knife. The pen is perhaps the best looking, most stealthy on the market. No one would ever think its anything other than a fancy writing tool. Plus, it’s waterproof and extremely well made. The only possible downside is its made oversees, making it pretty expensive to purchase. Also, it doesn’t have some the extra bells and whistles the other pens have. This pen is extremely durable. It’s lightweight aircraft aluminum ensures that it won’t break on you. Plus, it has a glass breaker on the tip. The all black design makes it hard to decode its secondary function as a weapon. The main selling point on this option is its price. It’ll get the job done and is only 14 dollars. 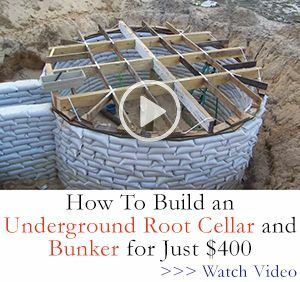 With other options running up 130 dollars, this is great for those surviving on a budget. Like many of the great choices above, this design is durable, comes with a glass breaker, solid grip, and is compatible with standard ink refills. What sets it apart is that it has all those features, plus a DNA collector for about ¼ of the price. A big downside is it doesn’t look too much like a pen. It will definitely get a good looking at from security. Other than that, this is product is high quality. Tactical pens are great secondary weapons and a feasible option for anyone who prefers not to carry a gun or who needs a concealed back-up to their gun. They are easy to conceal and carry. Look over the information above and find the right one for you and your family. Previous Is Tap Water Safe to Drink?